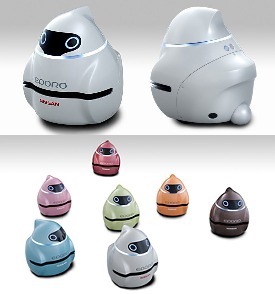 My source called these EPORO robot cars, but I don’t know if I feel comfortable calling these things cars. Unless these are cars from some alternate universe where penguins rule the world. Yes, they may not look like what Nissan usually rolls off the assembly line, but the EPORO robot cars are an advancement for the day when cars drive themselves like Knight Rider. You see, these EPORO robot cars are able to move in groups, and have software built in that keeps them from crashing into each other. Just think of them as bumper cars without the humans and without the bumps. I suppose a better comparison would be to schools of fish, who are able to travel without bumping into each other and fluidly avoid other obstacles. It sort of reminds me of the software used in Pixar’s classic Finding Nemo. Remember how the schools of fish traveled in schools, just like real fish? It would appear that Nissan took that tech a step higher, and plans to put six of the EPORO robots on display at CEATAC Japan next week. I like where EPORO technology is going. I suppose automated cars could easily be programmed to follow traffic signals, but Nissan has finally figured out how to keep automated vehicles from hitting each other. Are we that far away from Minority Report style automatic vehicles? I hope not. I would like to take nap in my car while on the way home.